The Company is Go! GO! GO!!!! If you like OpenQuest and want a bit of Modern Warfare in your gaming life, I’ve just put The Company on pre-order until the second week of December. Same clean D100 system as OQ with added rules for vehicles, guns etc , a plausible yet gamable setting, and two introductory adventures. 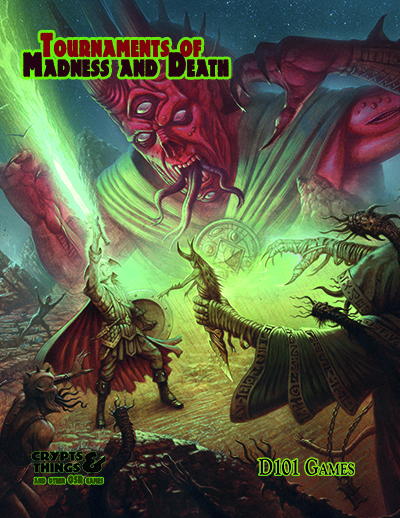 All in all 200+ pages worth of D100 goodness from us. Like Crypts and Things, if the Goal of the preorder is reached everyone gets the first adventure for FREE! Chris Helton over at Dorkland has just posted a review of OpenQuest. All in all, OpenQuest is a very solid fantasy gaming system that deserves a lot more attention than it receives. In 183 pages it manages to cover the basics of what any group would need out of a game system, and do it in a way that is simple and yet still manages to remain robust. If you are a fan of fantasy games, and do not yet have OpenQuest on your bookshelf (virtual or otherwise) then you need to fix this as soon as you can. Pre-order still open – now 50% towards the goal with one and half months to go! If we reach the goal everyone who pre-orders gets the first module for the game free! Its time to go to Furnace, my annual pilgrimage to this two day con in Sheffield UK. Last year I started what I hope will become an annual tradition, the Saturday night Old School D&D game. “Once the glorious capital of a world wide empire, betrayed to Demons by an arrogant Emperor who traded his citizens souls for immortality, the City of Eternal Damnation offers riches and secrets to those willing to risk their very soul in the pursuit of them in its ruined streets. This is going to be my ‘mega-dungeon’ which I’ll bring out at cons, or with my home group when when we are short of a game. A vast ruin of an ancient city,filled with weird encounters and mini-dungeons. Presently no plans to publish, just a scruffy pile of notes and head of ideas. Crypts and Things is now available to pre-order via IndieGoGo.com, in a variety of formats. The pre-order ends on December 2nd, so print copies will start shipping shortly after that. However every pre-order will get a Pdf copy as soon as the final proof is done, which is due to be mid-October. NOTE: The game will not go on general release until I’ve shipped the last of the pre-orders. If you like the front cover I’m doing a pre-order package which includes a limited edition T-shirt with it on it. Seeing as I’m using IndieGoGo.com for this, there’s a goal set for funds raised. One of the incentives to pre-order, rather than shamble along later and order when its on general release in Dec, is that if that goal is exceeded everyone effectively gets the first adventure module for the game, Blood of the Dragon, a sand box adventure for low levels.